A New York subway ticket machine. 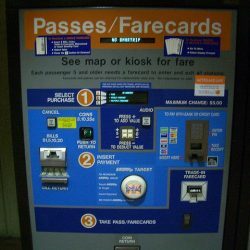 A Washington subway farecard machine. The most compelling graphical user interface (GUI) isn’t found in Silicon Valley or anywhere close to it. 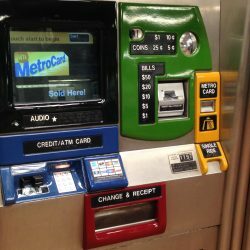 By far the best example of a GUI is the face of the fare machines of the New York City subway system – those big metal machines with green, red and yellow markings. The machines are designed to appeal to the broadest possible audience – harried straphangers – with a few New York seconds to spare. It is the best example I can think of an intuitive GUI. It’s even, dare I say, inviting. Every time I’m in the NYC subway, I find myself drawn to those machines because I sure as hell don’t want to be standing in a subway fare line at the old token booth staffed by surly MTA employees, like I’m waiting to pick up my prison garb. Now just for comparison, think about the subway fare machines in Washington, D.C.
Those fare machines, and in particular the fare structure visible above them, are incomprehensible. They are, alas, what you might expect from Washington, a town run by layers of lawyer-run committees catering to lawyers. That subway outfit needs a GUI overhaul, which means D.C. subway managers need to bring in some designers with stop clocks. If tourists can pay for a D.C. subway fare in under 15 seconds, that’s a good sign. Anything longer than that should be scrapped. OK, now take this subway fare machine parallel and lay it over a life insurance or an annuity contract. Simple term life is about as elegant as it gets, like the New York subway fare machines – or for that matter – the old MTA indestructible tokens which allowed you one ride per token. But a variable annuity contract that runs on for 125 pages? That’s the insurance world’s equivalent to the D.C. subway fare machines: uninviting and incomprehensible. An insurance contract and a subway fare are about as far apart as Earth is from Pluto. How can you compare the two? But the point is less to compare the two than to make a case for inviting a consumer to engage with an insurance or annuity product, or for an independent agent to engage with an insurer’s distribution platform. Yes, many annuity contracts are complex. The move toward transparency means still more disclosure. The more companies are under the authority to disclose, the more uninviting complex contracts are likely to become, so don’t expect any relief in that department. Agents often are similarly challenged. As every agent knows, the GUI is the most important agent-facing tool in an insurer’s toolbox. As younger agents replace retiring veterans and fill the ranks of life insurance distribution, more of them will gravitate toward and choose to sell on behalf of insurers that have user-friendly agent portals. Makes you wonder how much more productive agents would be if they had GUIs as simple and elegant as the New York subway fare machines. Perhaps the most ubiquitous GUI is the one we carry in our pockets. Having used a company-issued iPhone soon after it came out in 2007 and then last year switching to an Android platform because of native Google apps, I’ve concluded that the iPhone GUI is the more inviting of the two. Android may be a better system for developers and it may even do more for users, but it doesn’t invite me to use it. Every time I reboot my Motorola phone, there’s some sort of Star Wars-like image of two halves that click into a whole — with sound effects to boot — as if I’m in a spaceship ready to dock with an orbiting station. Great, Android’s taking me to the moon but I’m not looking for an invitation to party with Moon Unit, as Frank Zappa famously called his daughter. Invite me to use your phone, that’s all. There has to be a better, more inviting way to present complex material – assuming the industry wants to sell more annuity contracts, of course. Go see for yourself and let us know how long it takes you to buy a New York subway fare compared with how long it takes you to buy D.C. subway fare. Let us know how you make out and from what platform you’d rather buy.